A team of researchers at the Max Planck Institute for Astrophysics have not only produced the most accurate map of the observable Universe, but in fact made 40,000 different versions, each of them representing a possible Universe consistent with known galaxies. Hence, these 40,000 maps not only encode our present knowledge of the cosmic structure but their differences also show how unknown regions of the Universe might look. Fig. 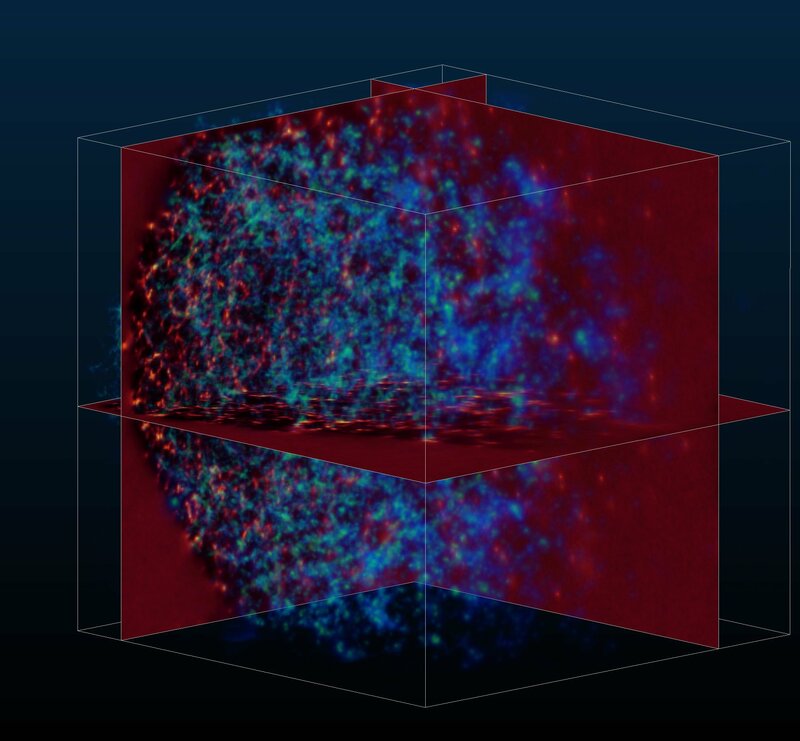 1: View (blue) and slices (red) of the mean cosmic map avaraged over the 40,000 possible Universes. Fig. 2: Slice through the mean of all 40,000 cosmic maps. These maps have been generated on the basis of the Sloan Digital Sky Surveys by using the HADES computer algorithm. 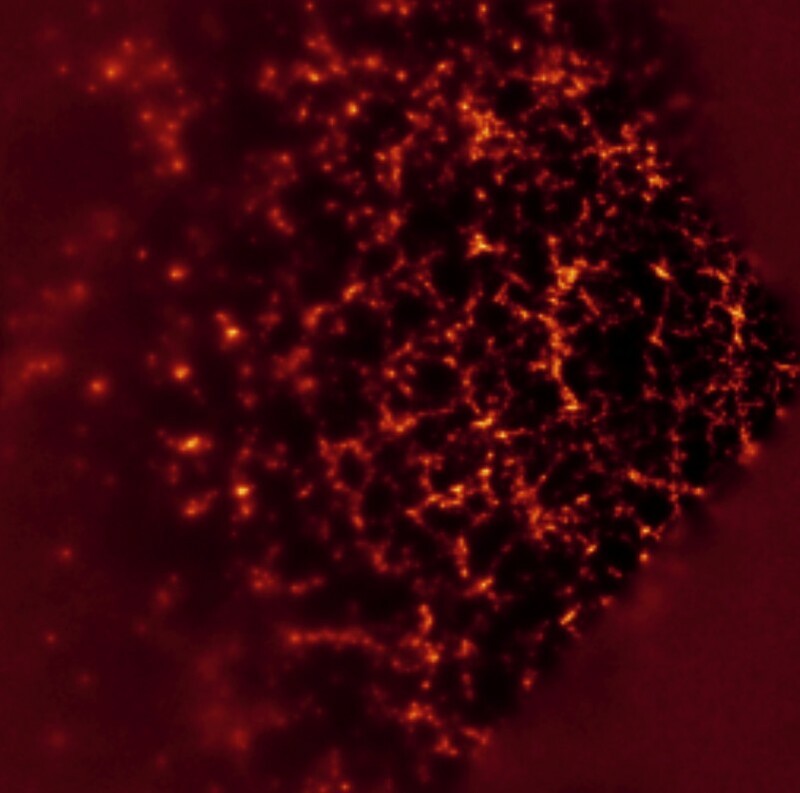 As predicted by simulations, the filamentary structure of the matter distribution in the Universe can clearly be seen. The according animation shows tomographic slices through the observed Universe and depicts the cosmic web with great accuracy. Fig. 3: Slice through one of the 40,000 possible cosmic maps. The according animation demonstrates the uncertainty of detecting individual structures in the Universe. The endless space of the Universe is filled with galaxies whose billion year old light can be observed with our telescopes today. However, galaxies are not distributed in an arbitrary way. In fact, galaxies mark the contours of a gigantic cosmic network. 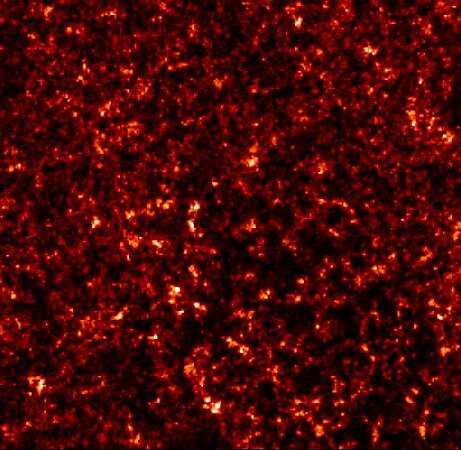 This network, consisting of mysterious invisible dark matter, was formed throughout cosmic history by the interaction of many physical phenomena. 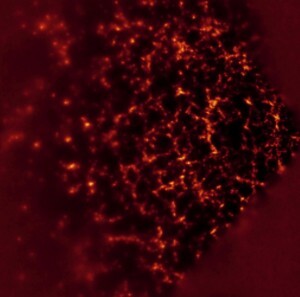 The origin of these observed structures are to be found in the microscopic quantum fluctuations which occurred during the initial split seconds of the Universe. During the following 14 billion years, predominantly, gravity formed these initial fluctuations into the cosmic web observed today. The exact measurement and mapping of these cosmic structures permits us to gain insight into the early phases of the Universe shortly after the big bang, when space was still filled with hot plasma and no stars or galaxies existed. Furthermore, analyses of this structure will shed light on the properties of cosmic matter, gravity and galaxy formation as well as the geometrical properties of space and time of the Universe. Such cosmic maps additionally permit the prediction of a variety of observational effects, which can be compared to actual measurements and used to test our understanding of space, time and matter. However, in contrast to sailors and discoverers in the past, who explored the outlines of the continents with their ships, today we can map the structures in the Universe only through our telescopes on Earth. Unfortunately, every observation or measurement of the galaxy distribution is always subject to a variety of observational uncertainties. In particular, decreasingly faint galaxies are detected with increasing distance from Earth. Consequently, with growing distance, also the information about the cosmic structure disappears in the fog of uncertainty. Hence, in large distances or poorly observed regions the cosmic structures appear fuzzy and their contours can only be estimated. Therefore, a scientifically useful map of the Universe must, aside from the description of the cosmic structure, also make statements regarding their plausibility. Here, the plausibility is quantified - according to the mathematician Bayes - using a probability, which expresses to what accuracy one can identify the cosmic web. The generation of such maps requires sampling of extremely high dimensional spaces and has been computationally impractical so far. For this reason, Jens Jasche from the Max Planck Institute for Astrophysics developed the computer algorithm HADES (HAmiltonian Density Estimation and Sampling). This algorithm now allows the analysis and assessment of three dimensional cosmic structures. HADES provides not only a single map of the Universe, it actually generates a full set of different maps. On average these maps represent the same observational data but differ in all other respects. Each of these maps hence displays a possible Universe, which is compatible with the observational data. Structures which are present in all maps are more credible than those which can be found only in a few maps. This set of maps therefore provides information about the credibility of all mapped structures, which is essential for subsequent scientific analyses. 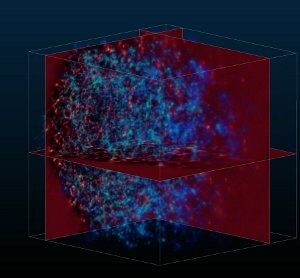 Based on this method, an international researcher team, consisting of scientists from the Max Planck Institute for Astrophysics in Germany and the Scuola Normale Superiore di Pisa in Italy, has now determined the most accurate representation of our cosmic environment from the Sloan Digital Sky Survey galaxy data. The analysis comprises a cubic volume of more than 2.1 billion light years and reflects in astonishing quality the large scale cosmic web. As predicted by simulations, this web consists of many filamentary structures and large empty regions. Overall, the scientists generated about 40,000 of such possible Universes and yielded three Tera byte of data. This permits them to judge the credibility of detected structures and to determine precise confidence limits. The obtained cosmic cartographical material now allows detailed analyses of galaxy and structure formation and the prediction of a variety of physical effects, which can be measured and tested by the Planck Surveyor satellite mission or the LOFAR radio interferometer. Future observations of the galaxy distribution will permit far larger and more detailed cosmic maps. Then the team of scientists at the Max Planck Institute will stand by to push the limits of the known Universe further into the depth of space.